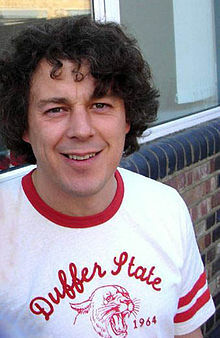 Alan Davies (born 6 March 1966) is an English comedian, writer and actor. He is best known for starring in Jonathan Creek and for being a panellist on QI. Davies was born in Loughton, Essex. His childhood years were spent in Chingford, London. Davies' mother died when he was six. He graduated in Drama from the University of Kent in 1988. In 2008, Davies was in the teen comedy Angus, Thongs and Perfect Snogging. Davies' first book, the autobiographical My Favourite People and Me, 1978-88, was published by Penguin Books in late 2009. Davies married writer Katie Maskell on 13 January 2007 after a 6-month engagement. The couple met backstage at QI in 2005. Their first child, Susie, was born on 9 December 2009. Their second child, Robert, was born on 18 June 2011. In late 2007 he made UK national news. The Times and Daily Telegraph reported that Davies was involved in a fight and bit the ear of a homeless man. Davies had just left a wake at the nearby Groucho Club. Davies is no longer allowed at the Groucho Club. Davies is a fan of Arsenal F.C. and a season ticket holder. ↑ Pearce, Garth (2008-07-11). "On the move: Alan Davies". London: The Sunday Times. Retrieved 2009-05-10. ↑ "Angus, Thongs and Full-Frontal Snogging (2008)". The Internet Movie Database. 25 July 2008. Retrieved 31 December 2011. ↑ Hoggard, Liz (1 March 2010). "Katie Davies: My life married to Alan Davies, London's funniest man". Evening Standard. Retrieved 14 November 2011. ↑ "Nov 11th, 2009". Twitter. Retrieved 11 February 2010. ↑ "Dec 9th, 2009". Twitter. Retrieved 11 February 2010. ↑ "Stephen Fry — Dec 9th, 2009". Twitter. Retrieved 11 February 2010. ↑ "Alan Davies - 18 June 2011". Twitter. Retrieved 18 June 2011. ↑ Foster, Patrick (2007-12-12). "Jonathan Creek actor Alan Davies 'bit tramp's ear' in tussle after friend's funeral". London: The Times. Retrieved 2008-02-10. ↑ Edwards, Richard (2007-12-12). "Jonathan Creek star Davies bites tramp's ear". The Daily Telegraph. Archived from the original on 13 February 2008. Retrieved 2008-02-12. ↑ Rifkind, Hugo (2009-08-22). "Alan Davies on QI, being attacked and that tramp". The Times. London. Retrieved 2009-08-23.